Award winning Filmmaker / Author John Borowski's (H.H. 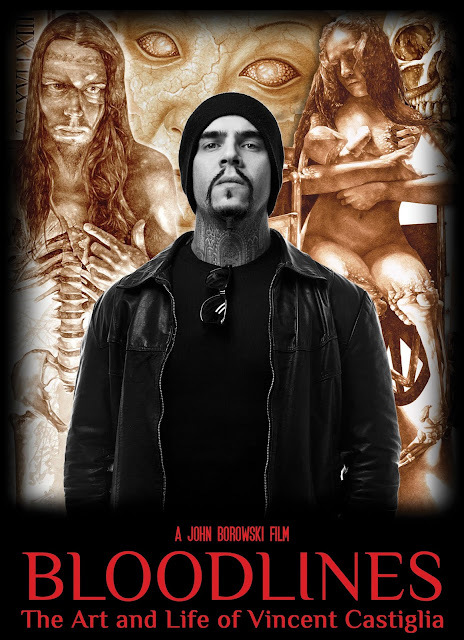 Holmes: America's First Serial Killer) fifth feature documentary film, Bloodlines: The Art and Life of Vincent Castiglia, will be released in North America on 13th November. The film focuses on artist Castiglia's painful life of abuse, addiction, and recovery while also exploring the reasons why the world renowned artist paints exclusively in human blood. Vincent Castiglia paints surreal images exclusively in human blood. He began doing so as a form of self-healing following a troubled childhood and painful existence. From darkness, however, came light, and Castiglia's story is one of inspiration and hope, providing proof that art can heal and serve to inspire others.